Adam McKay and Will Ferrell are the dynamic duo of comedy. Ferrell acts, McKay directs, and they both write the screenplay for their films. Their first film together, Anchorman: The Legend of Ron Burgundy was a laugh riot, and I would say that it’s still Ferrell’s most complete, enveloping performance. Talladega Nights: The Ballad of Ricky Bobby featured a better script and plot, along with characters who were more multi-dimensional. The laughs aren’t as frequent as Anchorman, but it’s a better film, and is Ferrell’s best comedy to date. 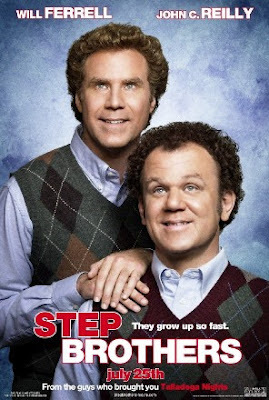 Now we have Step Brothers, Ferrell and McKay’s third outing. Simply put; this is their weakest film. It’s not a good movie. But boy was it funny. While this is drastically inferior to some other comedies this year (prime example being Forgetting Sarah Marshall), it’s easily the funniest. The laughs are frequent and strong. This is one of those “breathless from laughing” movies. Sadly, that’s really all the movie has going for it. One thing that made Talladega Nights excellent was the presence of John C. Reilly, who easily stole the show. Ferrell and Reilly have amazing comic chemistry, and the idea of having a film where the two had equal screen time was enough for me to sign up. Having McKay write and direct only makes the deal sweeter. Obviously, the three are a great comic team, with lots of creativity and ideas. Step Brothers feels like a mesh of hundreds of jokes and scenarios that the three might have imagined while sitting around on the set of Talladega. As such, the plot is virtually non-existant, and the movie wanders aimlessly for long stretches of time. These segments become tiresome, and while it is funny, the movie eventually becomes a bore, only to be rescued by a very good final act. The general scenario for the hilarity (I won’t call it a plot) is that Dale (Reilly) and Brennan (Ferrell) are two forty-year-old losers who live with their parent. Dale’s Dad marries Brennan’s mom, and now they are step brothers. At first, they hate each other with a passion, but over time, they become best friends. Ferrell and Reilly have a comedic chemistry that is unsurpassed by any other modern comic duo. Their interactions are always funny, and in this film, they work together so good that they feel like real people. That might just be the problem. Dale and Brennan act like 15 year olds, and that is not an exaggeration. The joke is that they are basically kids trapped in the bodies of adults. Very foul-mouthed, immature kids. This is funny for about half of the movie, but when you start to realize that the plot is headed nowhere, your mind begins to linger on the fact that these men are certifiably insane. Reilly and Ferrell’s performances are incredibly strong in this regard, adding a realism that hurts the film. Because the movie seems to take place in the real world, the insanity of the main characters soon becomes tiring rather than funny. Ron Burgundy was also crazy, as was Ricky Bobby. But their films happened in something only vaguely resembling reality, and as such, the joke never got tiring. In Step Brothers, you get the distinct impression that this would be funnier as a series of SNL skits. There was a point where, while the laughs were still coming, it was so aimless and bizarre that I felt like giving up on the movie. But just before passing the point of no return, McKay and Ferrell’s script reels the story back in and gives these characters a direction. They start acting less insane and more mature, and it becomes easier to laugh. The finale, featuring Ferrell singing Opera, is brilliant, and the ending leaves you with a smile. The problem with the movie is that it’s just horribly paced; the 95 minutes feel much, much longer. The bad pacing is a direct result of the aimless wandering of the screenplay, which always favors laughs over story. And if weren’t for the film being funny as hell, it would have gotten a big fat F.
Step Brothers is McKay and Ferrell’s first R rated film; in the world of comedy, you’re generally guaranteed to get more laughs out of something rated R that something that’s been toned down for general audiences, and Step Brothers is no exception. This is a very foul movie, and all the funnier for it. The F-bomb is sprinkled throughout, and whenever it’s uttered, a laugh is accompanied. I think that Judd Apatow-produced comedies have perfected comedic swearing to an art form, and this movie is the king in that regard. Sure, some of the vulgarity goes over the top, like Brennan doing something extremely horrid to Dale’s drum set. But had this movie been PG-13, it wouldn’t have been very funny; the concept demands a higher rating. While McKay and Ferrell take a big step back in the story department, they’ve taken another step forward in the characterization department; their script is rich with funny characters, some of whom are endearing (Dale and Brennan…sort of…) and some of whom you just want to punch. The latter would be Brennan’s younger brother Derrick, played to perfection by Adam Scott. The character is sort of the antagonist of the movie, and provides a constant stream of laughs. When Dale punches him in the face, I felt like cheering. Mary Steenburgen is essentially the straight-woman in the role of Brennan’s mother Nancy, and does a good job. Richard Jenkins is solid as Dale’s Dad Robert, but the character becomes too much of a jerk as the film progresses; Derrick is a jerk from the beginning, and always funny for it. Robert goes a step further, kind of like Dr. Leo Marvin in What About Bob?, but more insane than funny. The cast is rounded out by some other fine performances, and it’s a solid ensemble. But this is Reilly and Ferrell’s movie. Ultimately, all I wanted out of Step Brothers was a funny comedy that utilized both talents equally, and I suppose I got that. The film is funnier than say Knocked Up or Forgetting Sarah Marshall, but both of those had a strong plot with lots of depth; that’s what makes a great comedy. Step Brothers lacks both, and leaves you with an empty feeling. Hopefully, McKay’s next comedy can successfully blend this strong humor with a strong plot.